Twelve years a selectman, and longer as a musician and supporter of local music, David Unger died on January 17, at age 86. Known as the “Music Man,” David Unger performs at a July 4 concert of the Castine Town Band. Photo by Rosemary Wyman Order prints of selected PBP photos. 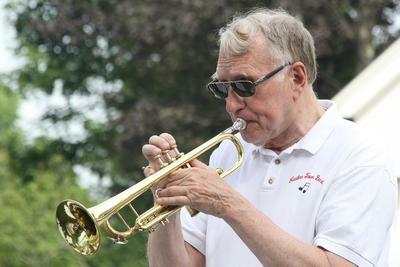 A selectman for 12 years, a charter member of the Castine Town Band, an avid trumpeter and music lover, and an active member of the Castine Arts Association, David G. Unger died in Castine on January 17. He was 86 years old. But while many knew Unger mainly as a selectman, his role as a musician and supporter of local music, and as companion to his poodle Lady Jane, also evoked strong memories. Unger became known as the “Music Man” for his support of local musical events, whether a town band performance, a performance of Castine Brass, of which he was a charter member, the Castine Arts Association annual winter Just For Fun concert, or bands he played with outside of Castine. After David’s wife, Carolyn, died in 2009, he opened his home and heart to Lady Jane, a small, white poodle. Every Wednesday he brought her to Pampered Pets in Orland for a grooming, and became more than a customer to owner Christina Abbott, who helped David train Lady Jane and took the poodle in after David’s death. David and Carolyn Unger moved to Castine in 1998 after he retired as Associate Chief and Acting Chief of the USDA Forest Service, where he had served for 13 years, first as Associate Deputy Chief for the National Forest Systems. Before joining the Forest Service, David was the Associate Chief of the Soil Conservation Service, Deputy Assistant Secretary of Agriculture for Natural Resources and Environment and Deputy Assistant Secretary of Agriculture. He was elected to the Castine Board of Selectmen in 2005 and re-elected three times, in races both contested and where he was the sole candidate. A thread noting his death on the You Know You Are From Castine, Maine If… Facebook page brought sadness, warm memories and relief that Lady Jane had quickly found a home. “Loved his witty comments and introductions at town concerts,” Donna Brophy wrote. David is survived by two sons, David, of Brooklyn, New York, and Christopher, of Hermon. A service for David will be held Saturday, January 26, at the Trinity Episcopal Church on Perkins Street at 2 p.m.